High-capacity adjustable punch drills through up to 160 sheets of 20 lb. paper and is engineered to take up to 30 percent less force to punch than comparable heavy-duty punches. Ergonomically designed handle and one-touch adjustable discs provide superior comfort, safety and ease of use. High-quality, sharp cutting heads create clean 9/32" holes and perfectly aligned presentations. Durable all-metal construction offers years of superior performance and antimicrobial protection. 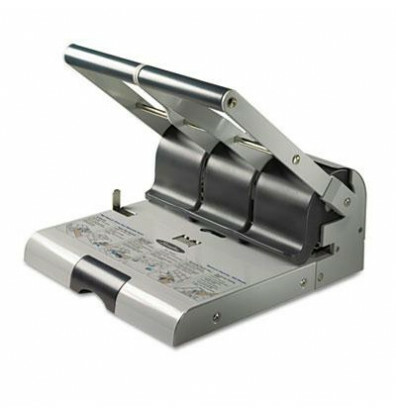 Punch also offers two-hole or three-hole punching flexibility.